Between the time when Operation Ivy broke up in 1989 and Rancid formed in 1991, Tim Armstrong and Matt Freeman formed several other bands. One of them, Dance Hall Crashers, went on to enjoy considerable success, but without Armstrong and Freeman, whose involvement was brief. Two others, Generator and Downfall, appeared and disappeared so quickly that if you didn’t live in the Bay Area and have some connection to the scene they inhabited, your chances of ever having seen or heard them would be slim indeed. 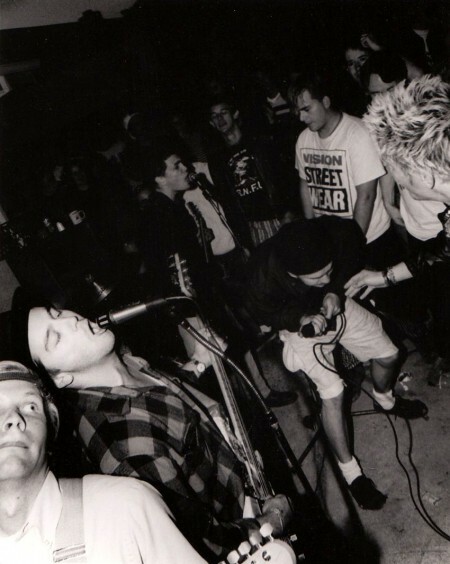 Both Operation Ivy and Rancid eventually achieved such iconic status that the in-between bands were almost completely overshadowed, but one of them, Downfall, has maintained a legendary if shadowy presence on the music scene for well over 20 years. There’s a reason for that, and it’s not just that they were a great band, which they were. It’s also that most of their music has only been available in the form of scratchy and tinny 8th-generation bootlegs, good enough to pique people’s curiosity, but not to satisfy it. There’s a reason for that, too, and during my days at Lookout Records, questions to the effect of “When’s the Downfall record coming out?” (yes, for those of you who weren’t around in those days, there was a Downfall record; no, it was never released) became so frequent and inevitable that they became a running joke with Lookout staffers. Not because they thought it was funny that so many people had ordered a record they never got, but because the question had become so utterly unanswerable. Here’s the story as best as I can tell it: Downfall recorded an album (a 10″ LP was the original plan), the release date (it would have been Lookout 99) was announced, orders came flooding in, and then, well, nothing happened for a long time. The cover art didn’t get drawn, the center labels (we were still doing everything on vinyl then) didn’t materialize, and somewhere in the middle of all the delays and uncertainty, Rancid started creating a lot of excitement for themselves. Between doing a 7″ for us and their first album for Epitaph, Downfall seemed to get lost in the shuffle. But wait. That wasn’t the end of the story. Two, three, four – I don’t even know anymore – years after the original release had been scheduled, Tim and Matt announced that they were at last ready to release the record, but that first it had to be remixed. Epitaph Records’ Brett Gurewitz took on this task and after some months handed back a topnotch product that sounded far more polished and professional than the hastily done original recording. Everyone who heard it was excited, and since by this time both Operation Ivy and Rancid were far more well known than they’d been a few years earlier, it was assumed that the Downfall record would be nothing less than massive when it finally hit the stores. Downfall at Gilman Street, October 1989, photo by Murray Bowles. And yet… it never happened. This time, the culprit, as near as anyone could tell, was Rancid’s breakthrough into the world of MTV and major label courtship. Bear in mind that this was during the time, following in the wake of the runaway, game-changing success of Green Day and the Offspring, that punk rock finally made it through to the masses. Madonna was backstage trying to sign Rancid to her new label, and she had plenty of competition. In the midst of all this, getting Tim or Matt on the phone became far more difficult, and running into them at Gilman considerably less likely. When I did talk to one or the other of them, I’d be assured that yeah, the Downfall record was still happening, but would have to wait until the current flurry of Rancid excitement settled down. When might that be? Oh, probably once the new Rancid album was released. The new album turned out to be And Out Come The Wolves, the biggest Rancid record ever, and among the top 10 or so biggest punk rock records ever. This did not help the excitement to “settle down,” instead launching Rancid into a nonstop round of touring and recording that was still going on when I left Lookout Records in 1997. I assumed the people who took over Lookout after my departure would continue to push for the record to be released – it was really too big not to – and that eventually it would be, but it was no longer my job to worry about it. I had my own personal copy to listen to – or did, until it got lost when I was moving house – and from time to time, when I ran into Tim or Matt, I’d ask them when it was going to happen, but eventually they got bored with answering or I got tired of asking, and that was more or less that. By then bootleg copies had begun to emerge, but they were mostly of the original recording, not the Gurewitz remix, and since they’d all originated on some ancient cassette and been reproduced countless times, the quality was decidedly substandard. And then of course, the new Lookout owners stopped paying royalties to most of their bands, the former members of Operation Ivy took back ownership of their records and severed all relations with Lookout, and any remaining chance of the Downfall release seeing daylight, at least on that label, vanished. What made it especially curious was the line that followed, or at least what a lot of people thought they heard: “There was a party, Adeline,” Adeline being a major thoroughfare on the the other side of town that didn’t go anywhere near North Berkeley. Eventually someone suggested that it sounded more like “out of line,” but with Tim’s patented marbles-in-mouth enunciation, it was never possible to know for sure. Anyway, the other part of the joke was that North Berkeley was about the least likely part of town for any crime scene to unfold. West Berkeley, sure, South Berkeley, even more so, and South Campus provided easy pickings for muggers who preyed on clueless and often pie-eyed college students. Even downtown, where I lived, could get a little rough, too, but North Berkeley? That was where the rich folks and the professors and the people with maids and gardeners lived. Well, maybe I exaggerate slightly about the maids and gardeners, but that was the way it looked to those of us from the other side of University Avenue. Oh, but a couple years earlier, I’d moved into a room in a house on Berkeley Way. Though still well within reach of downtown’s urban ills, including a tribe of squatters in the backyard cottage and a one-family ghetto across the street, it was a block north of University Avenue. Its location led to an uproarious but eventually hilarious bustup with Tim or, as I was probably still calling him at the time, Lint. We were talking about ideas for record cover art. Tim wanted to use a big picture of a gun, and I was trying to persuade him not to. This was in the heyday of gangster rap, remember, as well as the crack cocaine wars, and I thought it sent a bad message. 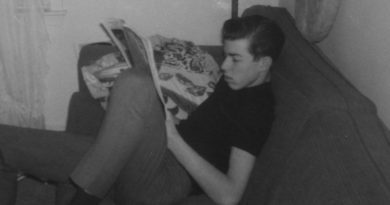 It’s true that Tim had recently moved into a room above a liquor store in one of the grittier parts of South Berkeley, but he’d spent most of his life in the very placid and tranquil suburb of Albany, which is even north of North Berkeley. I pointed this out, adding that my $100 a month room one block past University was not likely to qualify me for membership in the early 90s version of the 1%, but he wasn’t having it, and stuck fast to his definition: “North Berkeley starts north of University, and you’re north of University.” It’s not that often that someone can reduce me to an inarticulate mashup of laughter, outrage, and flabbergastedness, but Lint certainly managed it that day. Eventually he got his gun on a record cover. No one was murdered as a result, at least as far as I know, and the record sold in the hundreds of thousands. Whether or not that disproved my original point remains open to discussion, but I suspect most people would feel it did. Just as almost everyone would agree I’d been famously wrong when I’d tried to talk Lint out of naming his new band Rancid. “Yo, Larry, that don’t matter, cuz we’ll give it a new meaning,” was his answer, and I guess he turned out to be right again. The damndest thing is that I started out to write this article about crime in Berkeley – yes, even in North Berkeley – and how the old town isn’t what it used to be. The Downfall reference was meant to be no more than a hook to hang it on, but somehow turned into the whole story, and now I’m out of space and time. Which is probably for the best, because Bay Areans get mighty butthurt at the slightest suggestion that their little slice of Northern California is anything less than an enduring countercultural nirvana, and I really don’t have the energy to argue with them about it. Besides, someone recently handed me a digital copy of the Downfall remix to replace the one I lost so many years ago, and I’ve been letting the music and the memories wash over me to the point where you know what? I can’t, at least for now, get that fired up about the socio-cultural ramifications of Berkeley’s drug and idealism-addled admixture of benign tolerance and malign neglect (or maybe I’ve got that backward?). But I will have to say that Downfall were a pretty decent band, and those were some interesting times to live through. Thanks, once again, for a great story. Felt like I was there for a few minutes. Keep passing down that folk lore, er punk lore. You Berkeley folk are soft, try living in a real city like Stockton . The funny thing is that the album almost didn’t make it in to the KMUD studios because of the cover. I went to the music director and said “yeah I know this Rancid album came out, and I have been assured a copy was sent to KMUD, but I haven’t seen it yet” and the music director said “oh, it’s been kicking around here for a long time, I thought no one would want to play it because of the gun on the cover”. I don’t remember the exact conversation, but it was something like that. I am not sure if she was serious about the reasoning or the volume of music that came in was such she just didn’t put things in there unless she liked them, or what, but that was the reason she gave me. Which is why I’m a Republican now. A California Republican because the left is FOS. And it’s MUCH MORE PUNK to be a Repub NOW. Yeah we’re still pro-choice, green, bicycle riders but we also grew up. Is there anyone more punk rock than Michael Savage, another Bay Arean? No. He is still the master. What a terrific story! I remember having a copy of the crappy 8th generation bootleg cassette. I was really bummed when the album never came out. I think I ordered it while I was still living in Denver on the advice of a friend. I had no idea there was a better mix out there. I thought the Downfall tapes got burned in an oven. This is true, but luckily the ashes were captured by a special digital filter that was able to remaster them into an even more outstanding sounding record! Well, do you think that it will ever be released? Is there a possibility that you, being the generous human being you are, will ever put the Gurewitz remix online for the fans?